"We haven't had any irony here since about, uh, '83, when I was the only practitioner of it. And I stopped because I was tired of being stared at." In 1984 I did my Law Society Finals in Chester Training College, in the somewhat inauspiciously numbered Room 101. Both perfectly true facts, incidentally, but could mentioning them be copyright infringement? According to this article, the Orwell Estate may think so. The supplier of T-shirts bearing the slogan "1984 is already here" via the Cafe Press website found himself on the wrong end of a DMCA take down notice issued by the Orwell Estate. Cafe Press suspended his listing of the T-shirts in question, and the supplier was quick to label the action as being an ironically Orwellian suppression of free speech. It is settled law that the title of a work is not normally capable of being a copyright work on its own account. Francis Day and Hunter v. Twentieth Century Fox , 1938 Privy Council decided, with respect to "The Man Who Broke The Bank at Monte Carlo", the title was not sufficiently substantial for a film having the same name as the song to be an infringement. "Nineteen Eighty-Four" is of course a much shorter title than "The Man Who Broke The Bank at Monte Carlo" and, to make matters worse, the T-shirts used the numerical form "1984" which is not that used in the book's title. However, the Guardian has a rather different account of events. Specifically, A.M. Heath, the agency representing the Estate, claimed that the notice had not been directed at the T-shirts but at beer mugs reproducing photographs, copyright in which was owned by the Orwell Estate, and quotations. A photograph is undoubtedly a copyright work and someone using a photograph without permission for commercial purposes is highly unlikely to be able to show fair use (US standard) or fair dealing for a permitted purpose (UK). Quotations are a much greyer area. To show copyright infringement by taking one quotation from a full-length book, one has first to show that the part taken is "substantial". This is a qualitative not quantitative test, so it is possible that taking a dozen or so words from Nineteen Eight-Four's total 88,942 wordcount might infringe, if the words were significant enough in the context of the book as a whole. Even if the amount taken did constitute a substantial part, issues of fair use/dealing would need to be considered. Copyright holders cannot shirk their duty to consider—in good faith and prior to sending a takedown notification—whether allegedly infringing material constitutes fair use, a use which the DMCA plainly contemplates as authorized by the law. That this step imposes responsibility on copyright holders is not a reason for us to reject it. However, the copyright holder merely has a duty to consider the issue in good faith, not to get it right. Nor is there a specific duty on the internet service provider to whom the DMCA notice is addressed to give consideration to whether it is only taking down the specific items requested or whether it may be over-interpreting the notice and taking down far too many items out of excess caution. This seems to have been most probably what happened with Cafe Press and the Orwell Estate. On receipt of the DMCA notice, Cafe Press seems to have applied a blanket takedown policy, without considering the specific details or merits of the request. This is a problem which is only likely to get worse, as mechanised take-down and enforcement procedures against platforms which host a wide variety of content spreads. The temptation is to avoid trouble by taking everything vaguely risky down, without applying nuance or judgement. So, not conscious oppression, but knee-jerk conformity to authority, coupled with a reflexive desire to super-please that authority. Not very far from something Orwell would have recognised, at that. 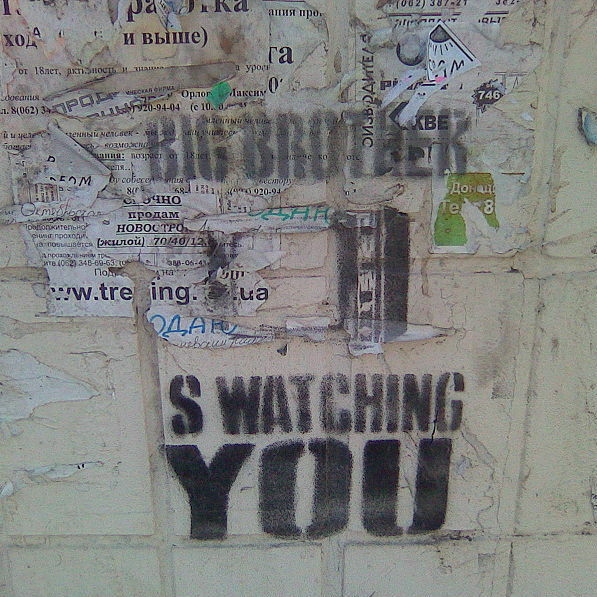 The main image used for this article is: 'Big Brother Orwell '1984' in Donetsk, Ukraine April 2010' and was used under the terms detailed at the above link on the date this article was first published.